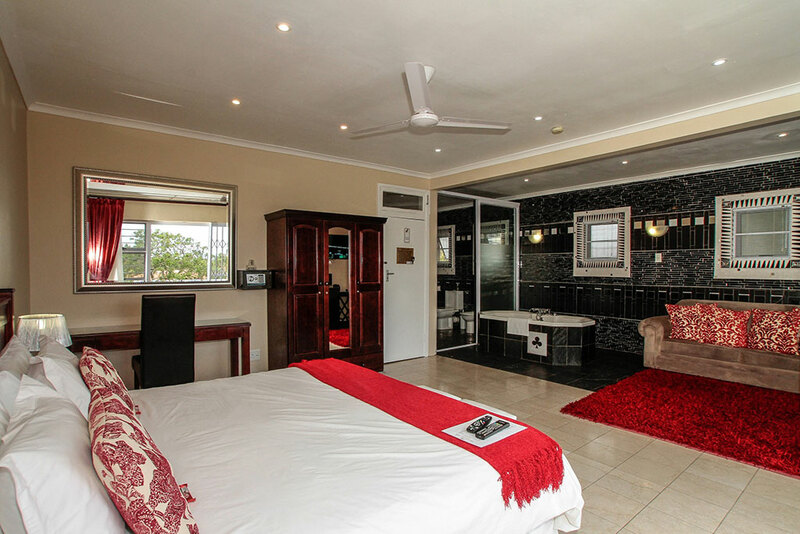 is a standard luxury suite. 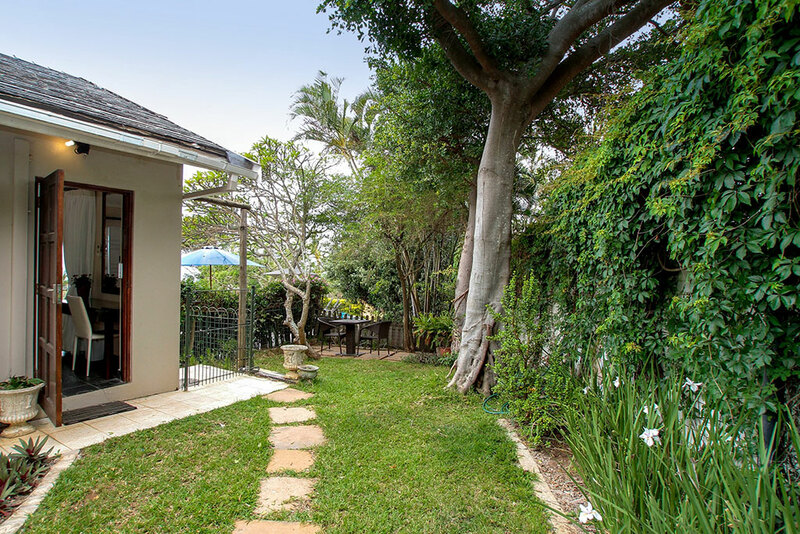 It faces north east towards Umhlanga Rocks. 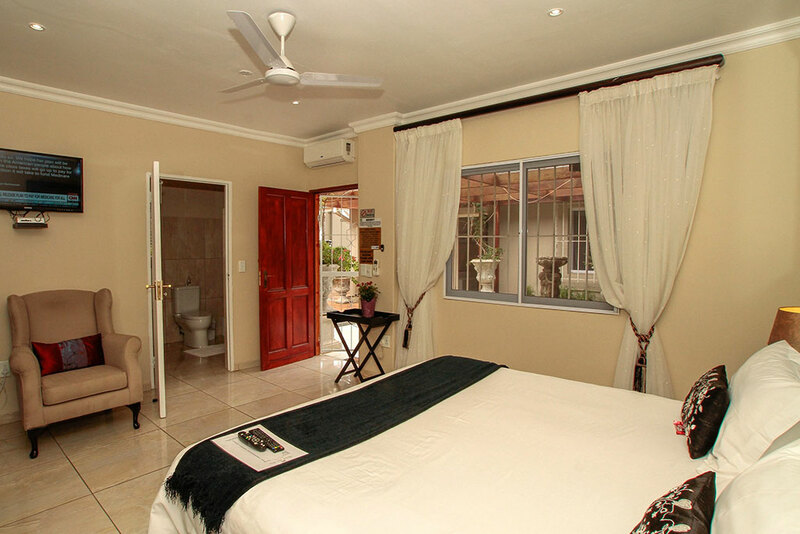 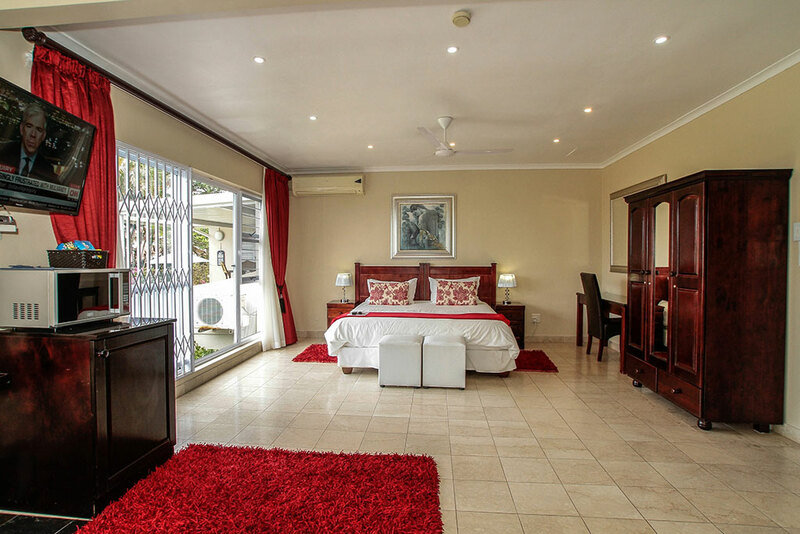 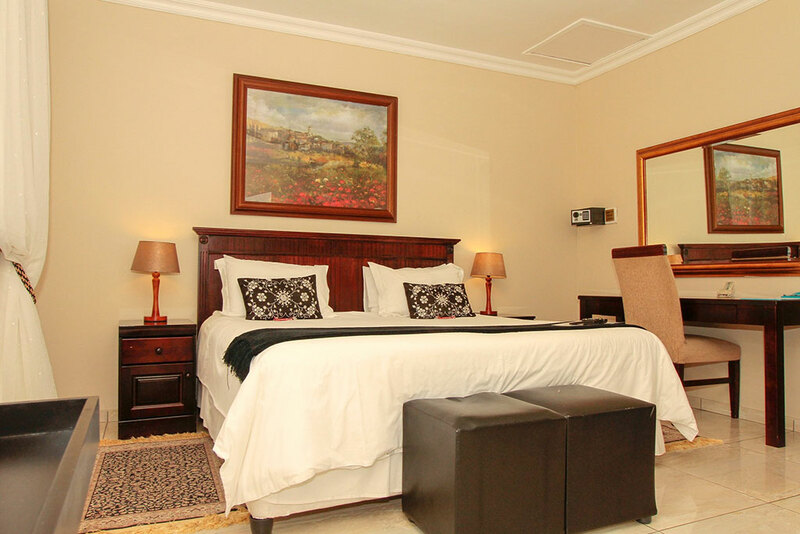 It is a light and airy suite with spacious en suite bathroom and offers privacy, peace and tranquility. 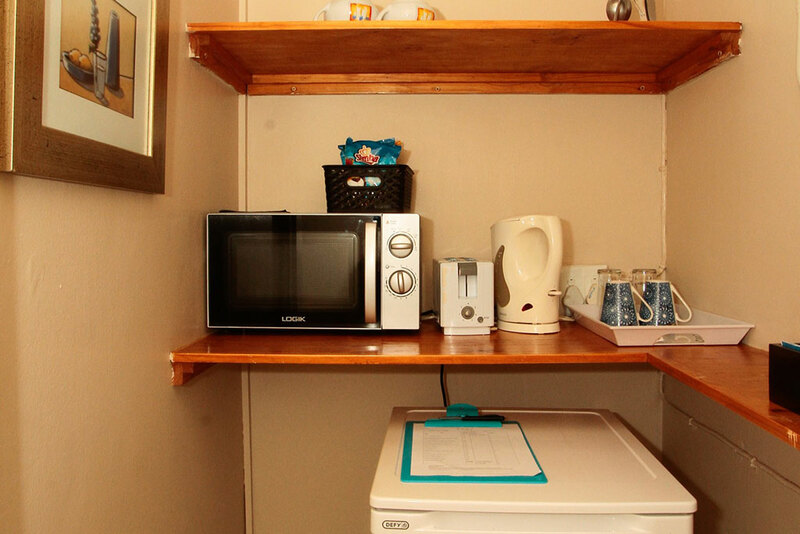 Suite 1 has, in addition to the standard amenities, a microwave, kettle, toaster, crockery & cutlery. 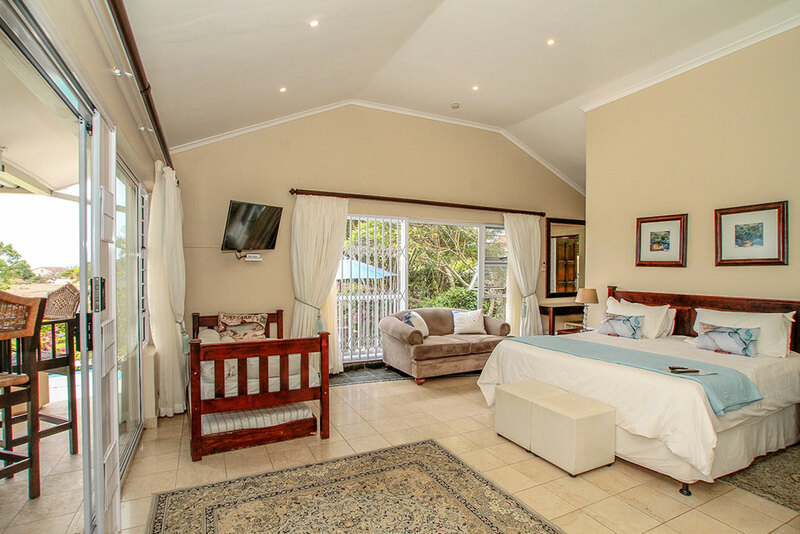 This Suite has a private entrance into the garden, is pet friendly on request and shares a passage with Suite 3, which can be closed off from the rest of the house to create a double,inter-leading, private family suite. 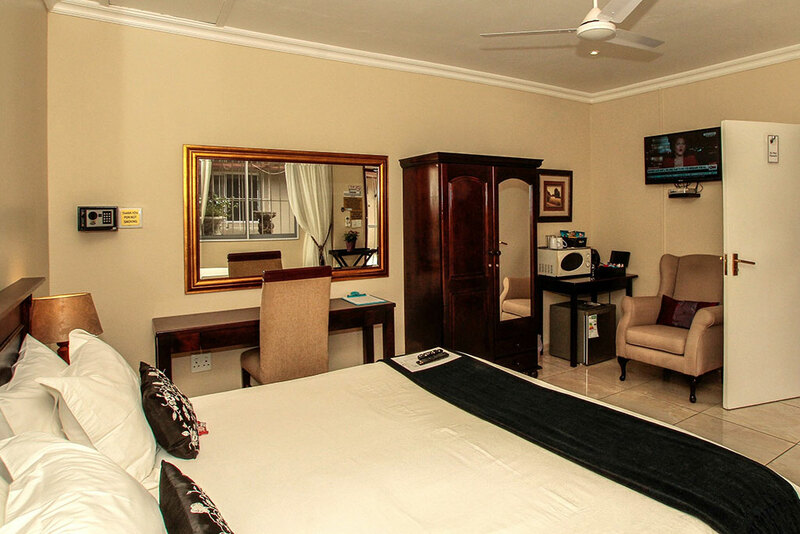 Suite 2 is a standard luxury suite. 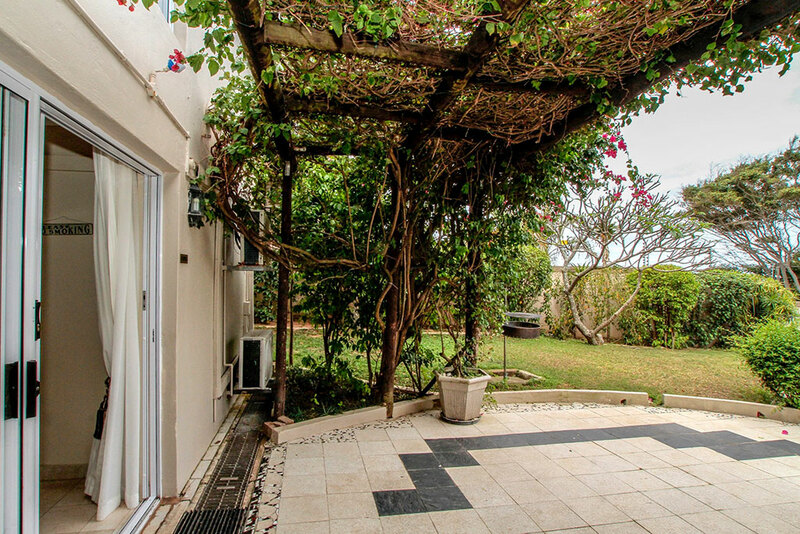 It has a private entrance with view of the garden and water feature. 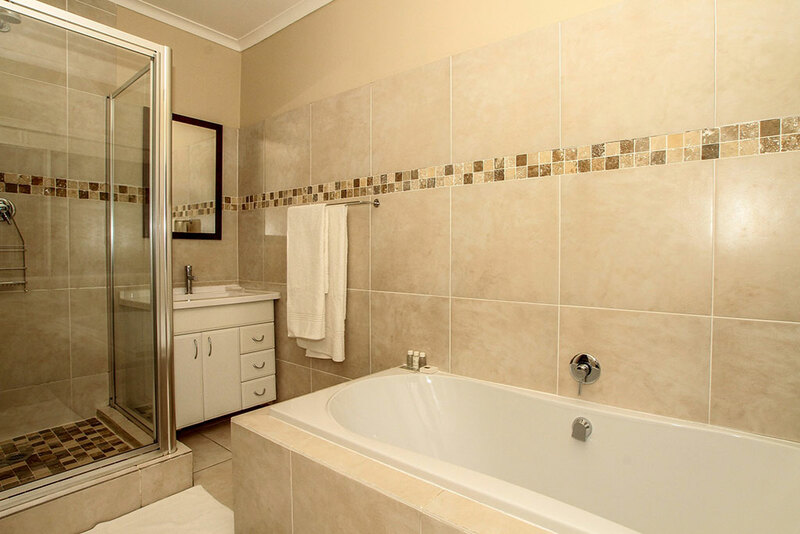 It is a bright and airy suite with spacious en suite bathroom, is tastefully decorated and has a warm and inviting ambiance. 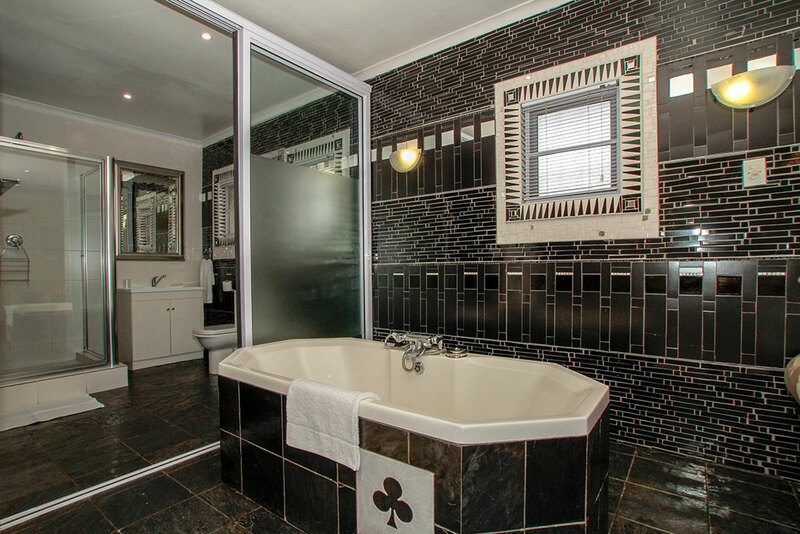 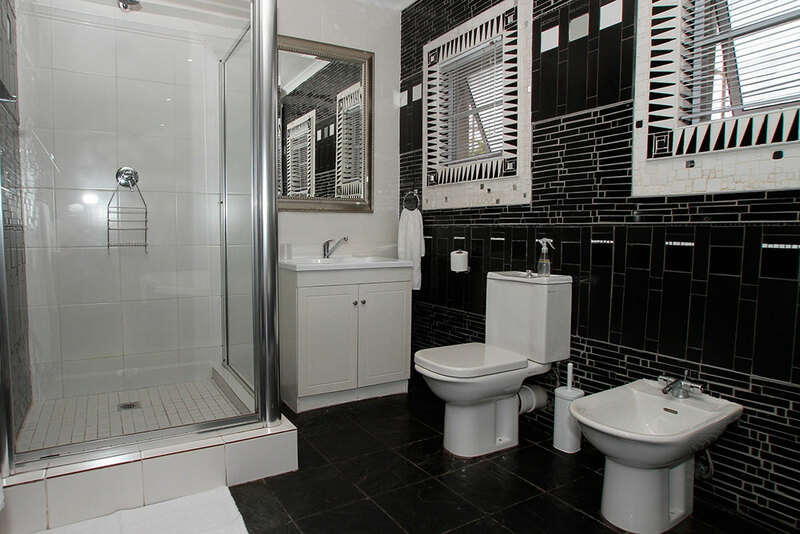 *Romantic, spacious, private and luxurious, the Honeymoon Suite is decorated in reds, greys, black and white to compliment the exquisite bathroom which was hand mosaiced in white, black and mirror by internationally renowned artist Jane Du Rand. 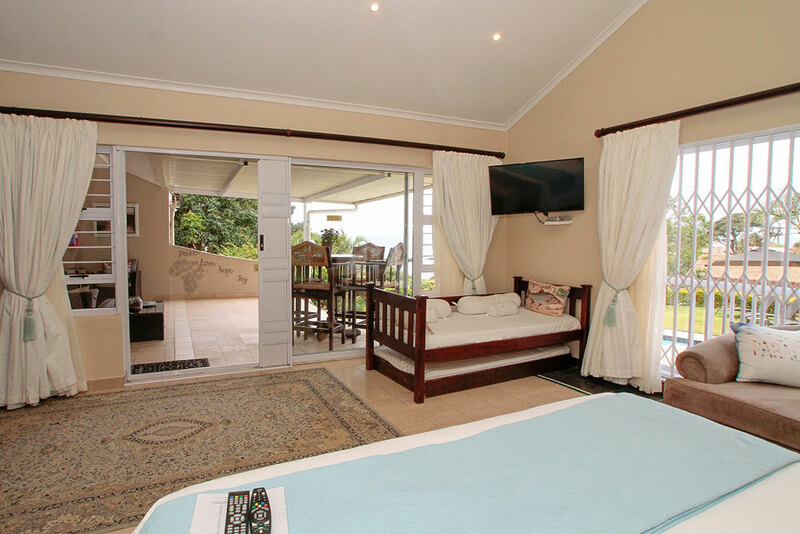 This one of a kind suite has spectacular sea and garden views and will make your stay at Chartwell Guest House utterly unforgettable. 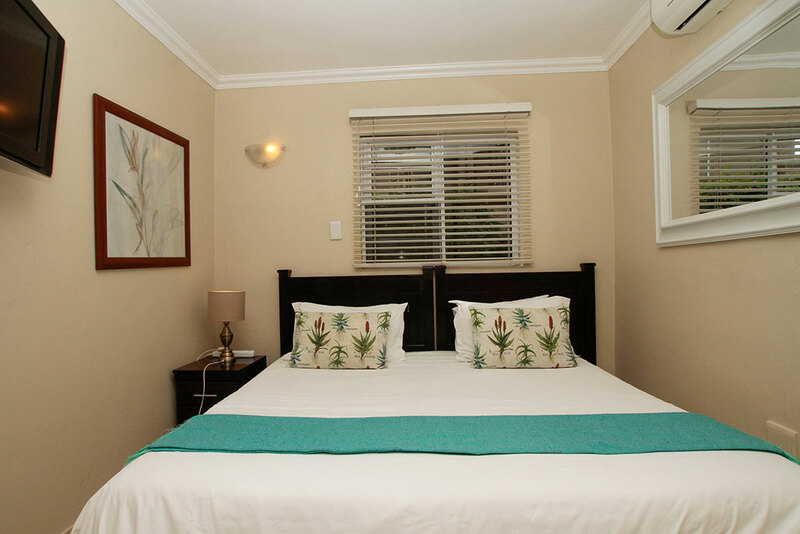 Suite 3 shares a passage with Suite 1, which can be closed off from the rest of the house to create a double, inter-leading, private family suite, ideal for couples who want both privacy and their children close by. 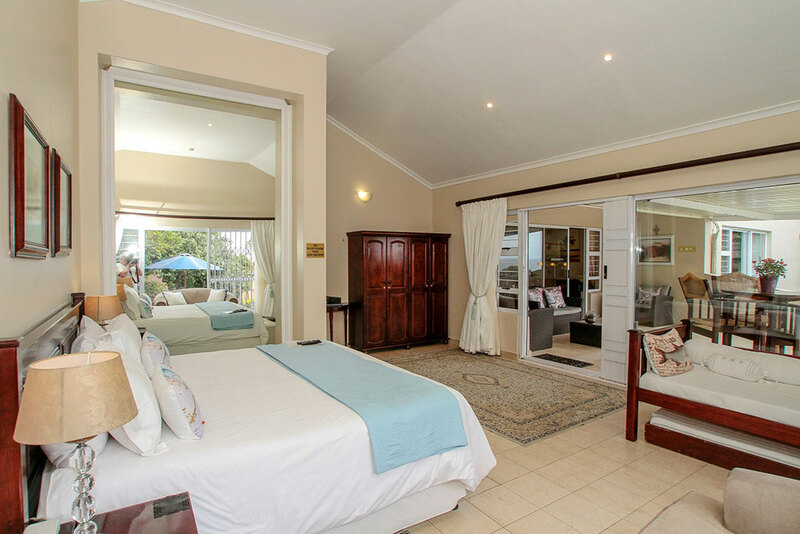 The Garden Suite is spacious, private and luxuriously appointed. 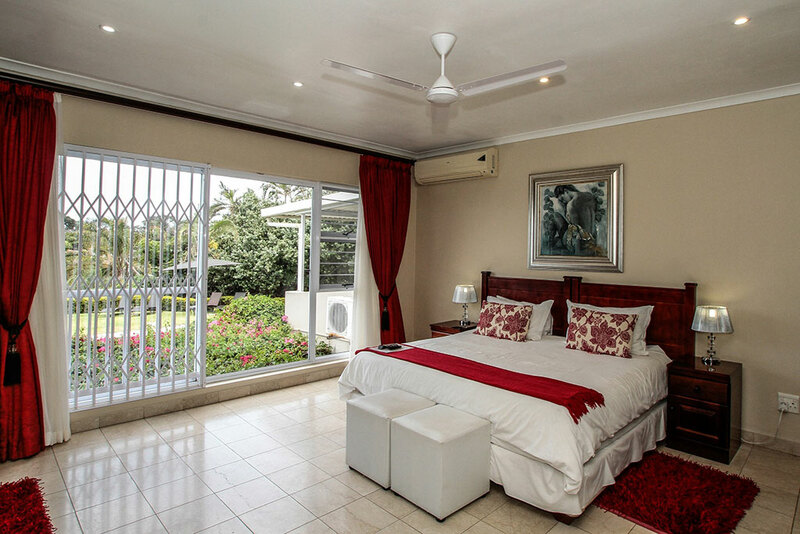 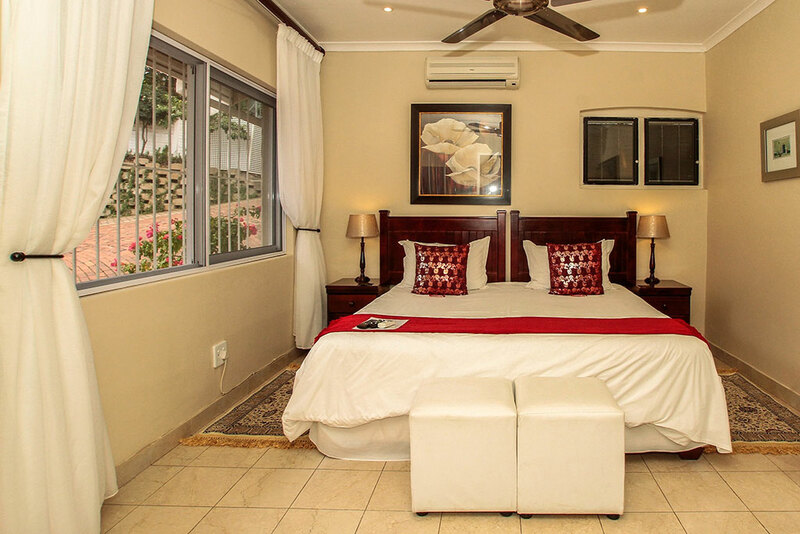 This suite comprises two interleading rooms – the main bedroom has a king bed (or 2 single beds) and the second smaller room has 2 single beds, perfect for kids or a 4 ball. 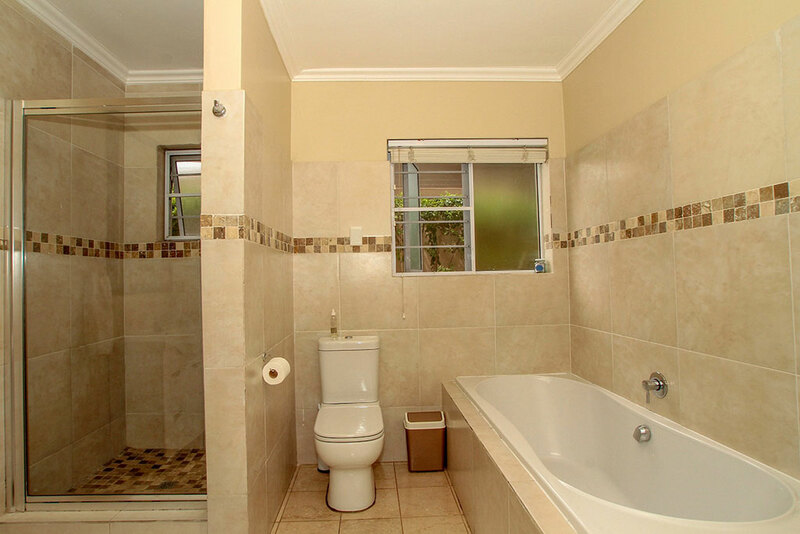 There is one en suite bathroom with bath and shower. 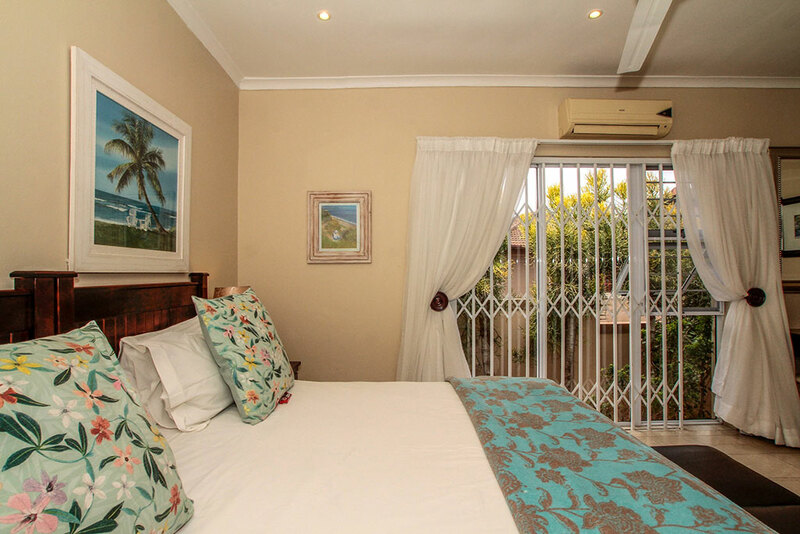 Suite 4 boasts its own entrance, private garden & patio, outdoor dining table and chairs, lounge area, kettle, tea & coffee facilities, fridge, toaster, microwave, cutlery & crockery and space for an additional single bed. 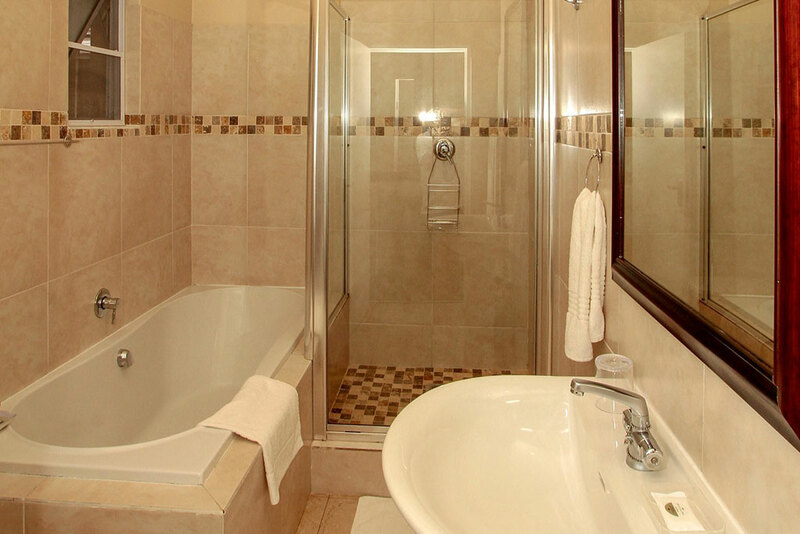 Suite 4 is pet-friendly on request. 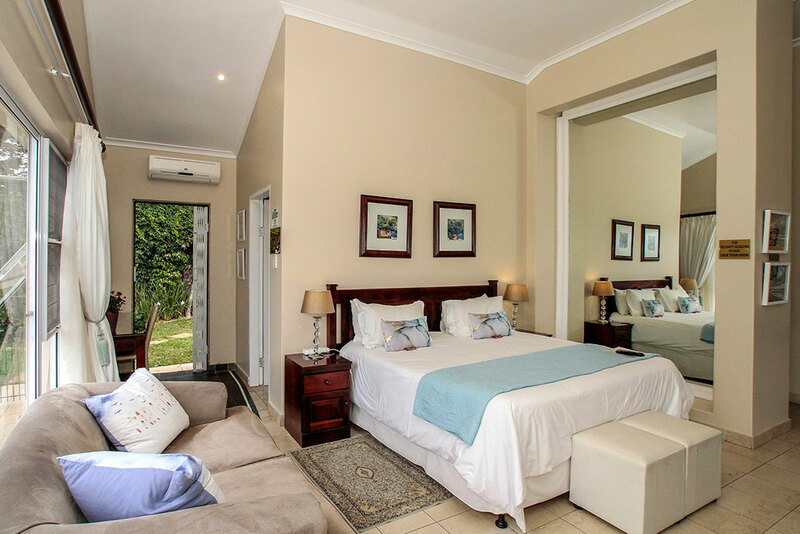 After a long hot day playing golf or enjoying some family time at the beach, take a dip in the pool, relax in this cool oasis and enjoy a refreshing drink under your private bougainvillea blossom covered pergola. 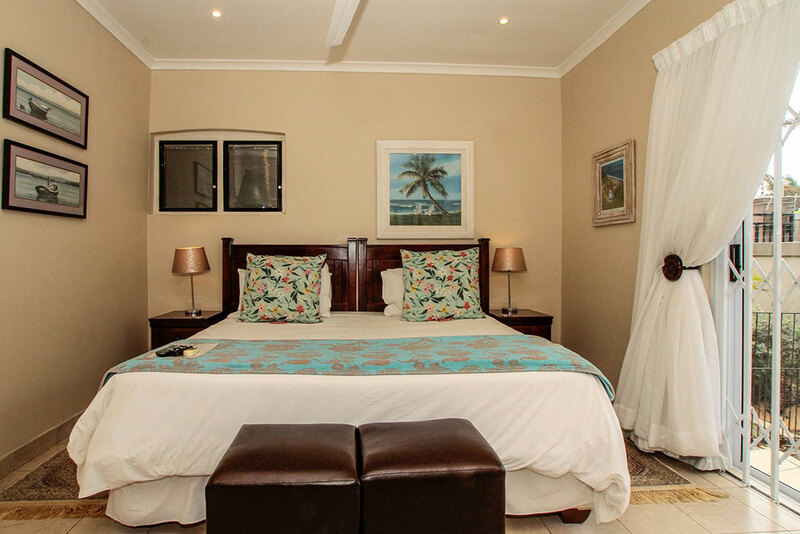 The Royal suite is a beautiful suite, lavishly decorated in blues and whites and is fit for Royalty. 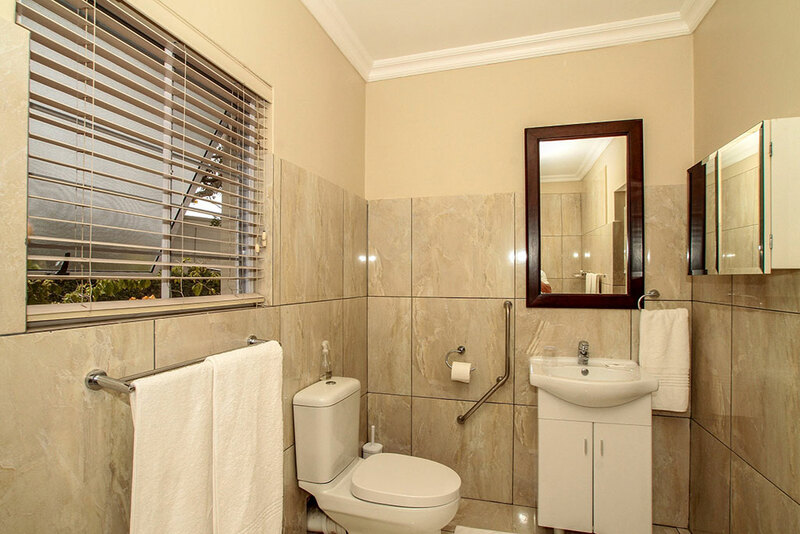 A magnificent mirror reflects the beautiful sea view. 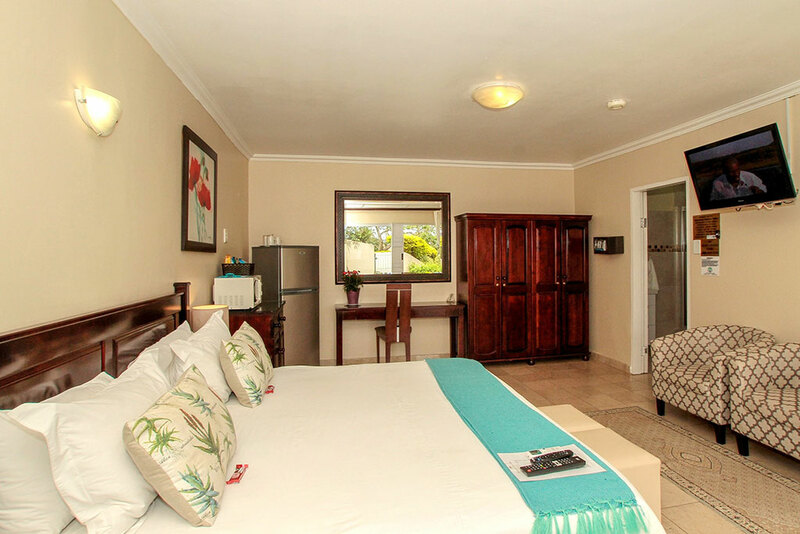 This suite opens to a delightful patio which has lovely views of the pool, garden and the big blue sea. 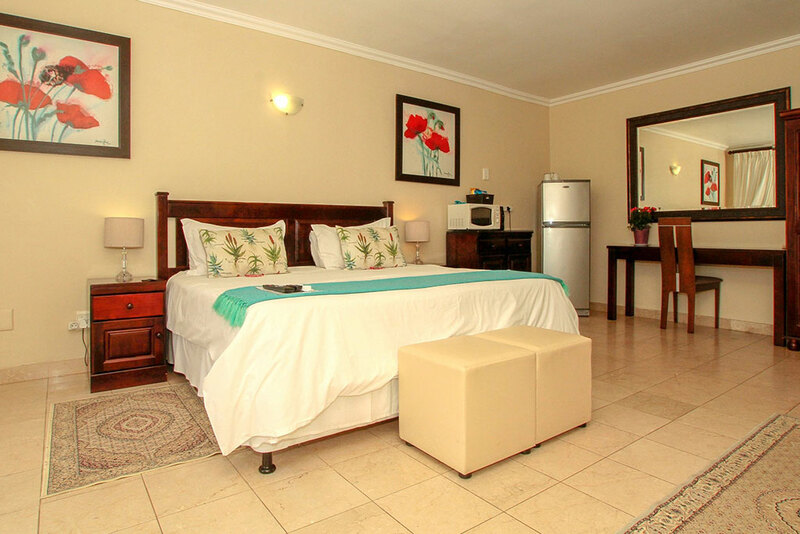 king bed, couch, additional bed, private entrance and garden, microwave, kettle, toaster, bar fridge, and hospitality tray. 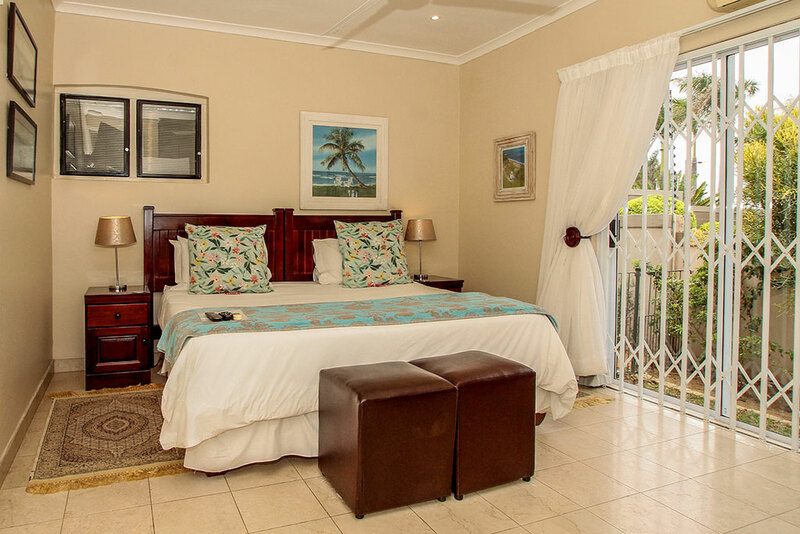 Recline on the day-bed and listen to the cascading pool whilst sipping something cool and delicious or relax on the adjoining patio where you can follow our advice – don't just do something, sit there. 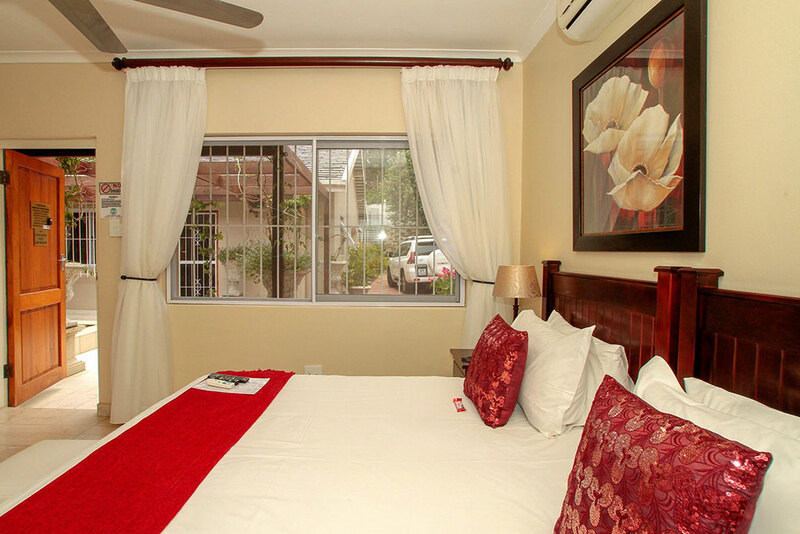 Suite 5 is pet-friendly on request. 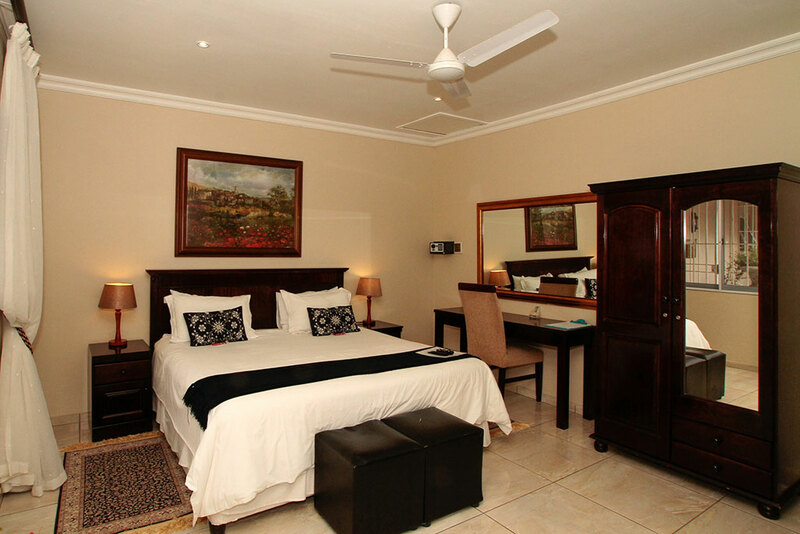 Our latest addition, this suite is conveniently located near the entrance to the guest house. 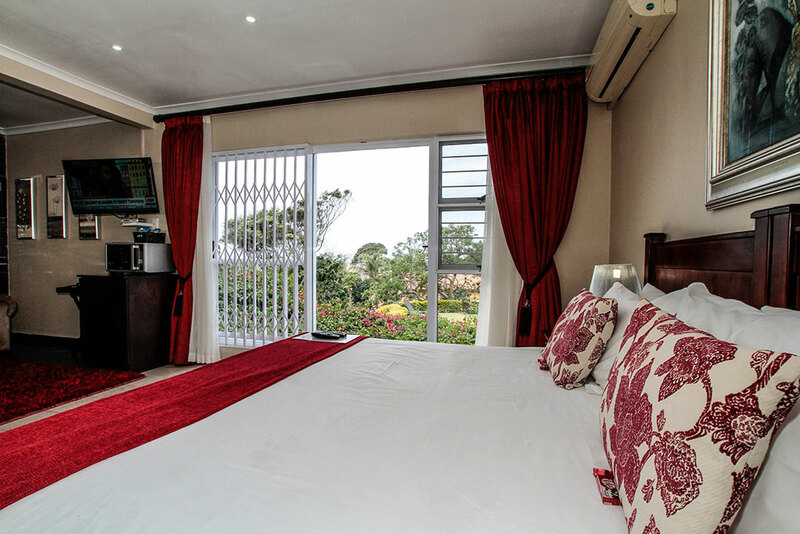 It is a sunny, warm and well-appointed suite with touches of dramatic hues and a view of our tinkling water feature. 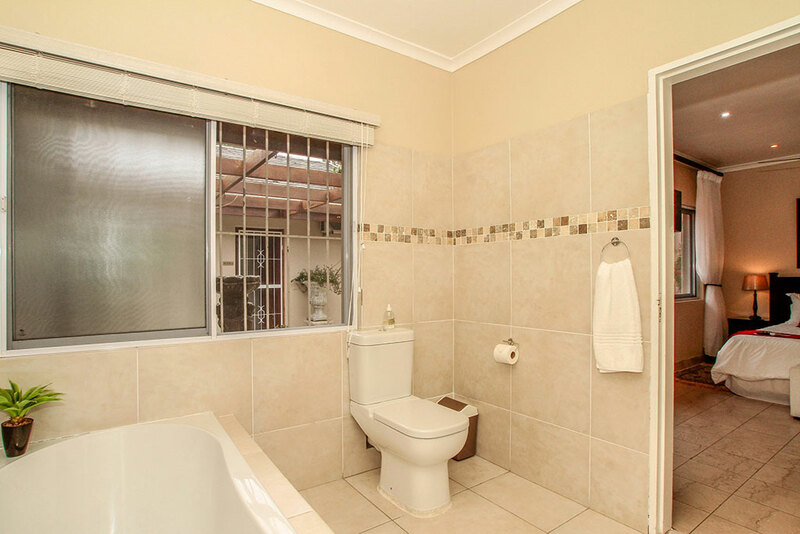 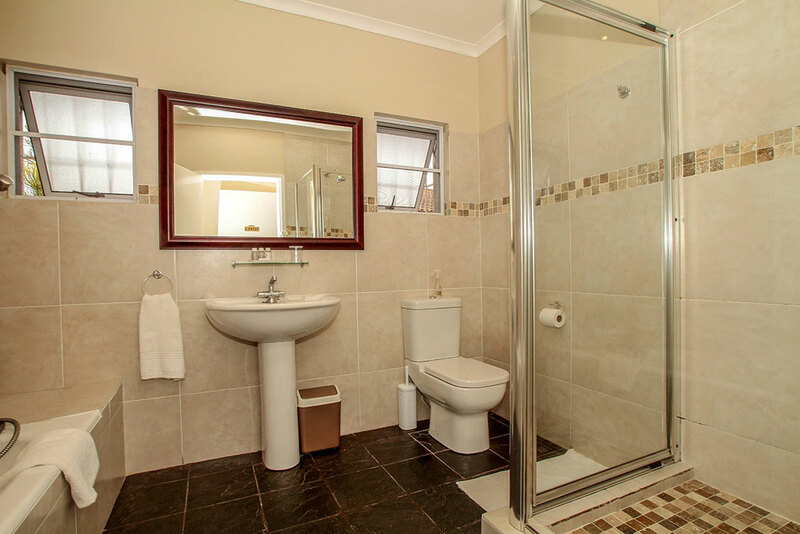 The bathroom is spacious and boasts a stepless shower big enough for two. 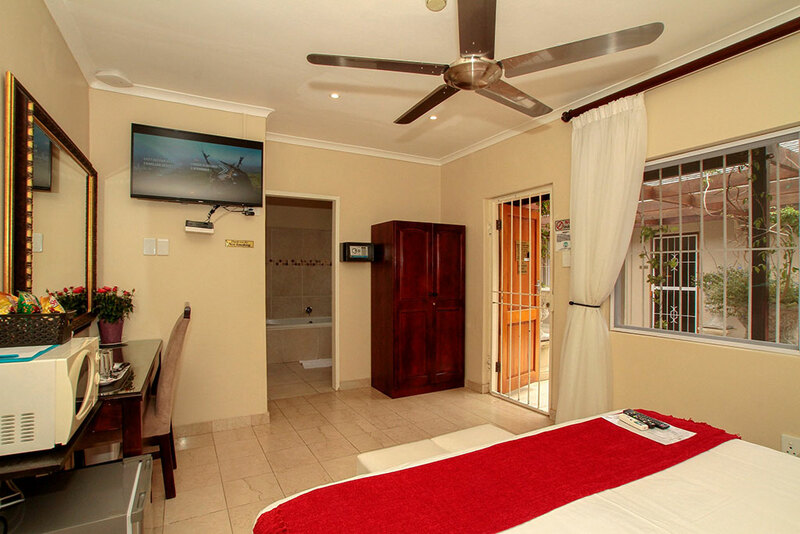 This suite has a private entrance and is also wheelchair friendly. 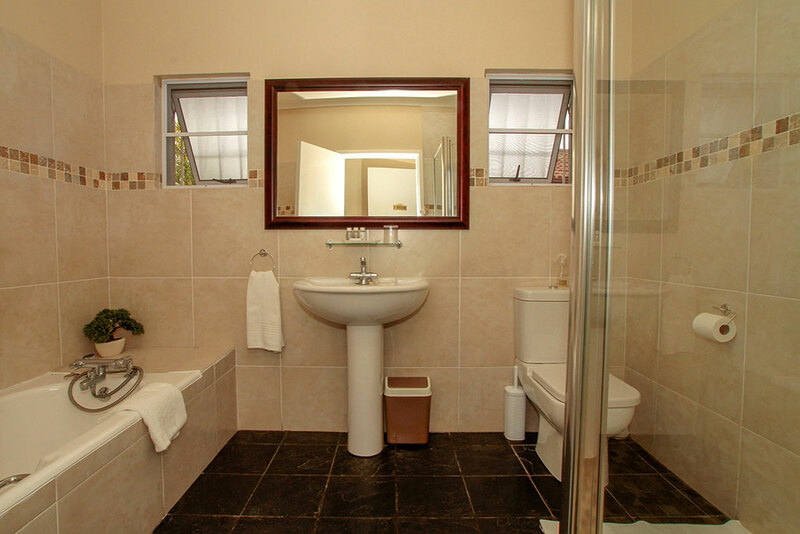 Our Budget Suite is well-priced and always in demand. 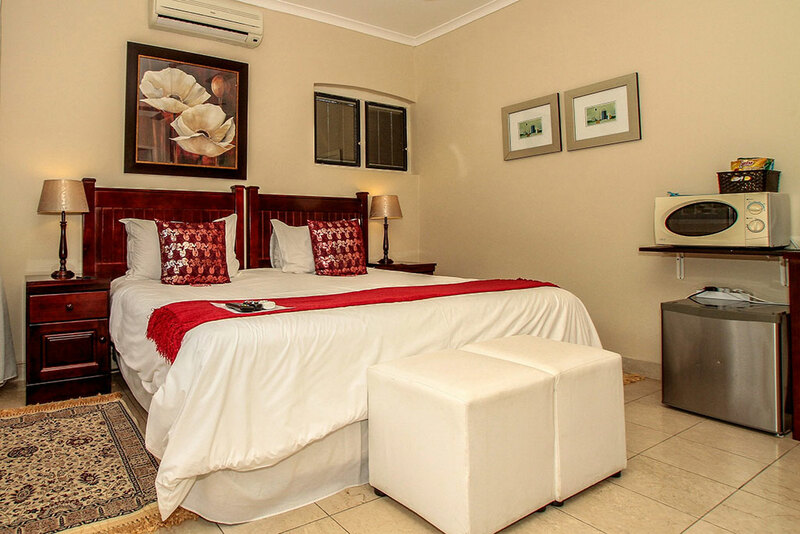 This luxurious suite has a cozy ambiance, queen sized bed, lounge area, a neat and compact bathroom with shower, private patio and a private entrance at the front of the guest house. 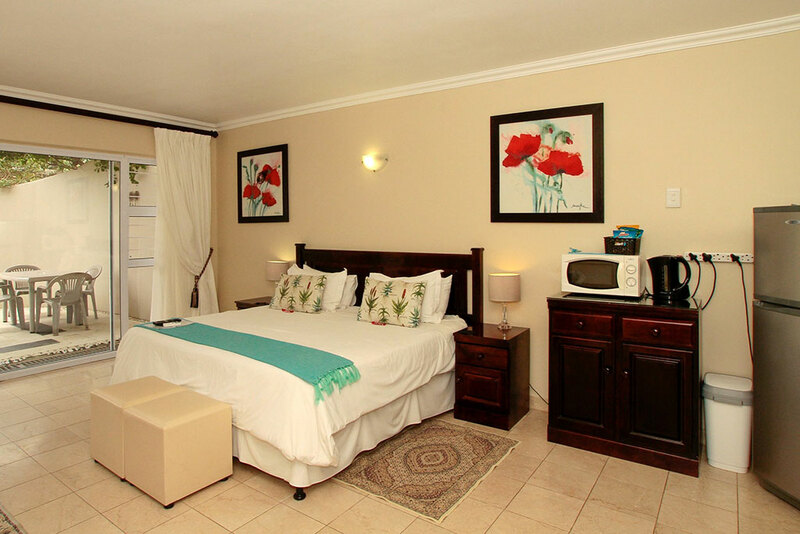 It's the perfect suite for a quick stop over or an affordable getaway.